In an attempt to fool our ladies into thinking that this site is not just about whisky, here is another recipe I have been perfecting for the last 6 months (Ritchie 'the Converted' take note as this recipe with turn you to bourbon in a big way). This recipe is specifically about bourbon and beans and very little else. If you like beans then this is a recipe you should try at least once. It works just as well on it's own served on a bed of rice or as an accompaniment to a meal such as smokey pork ribs. This dish is great because it tastes great hot or cold. Firstly, the bourbon of choice. 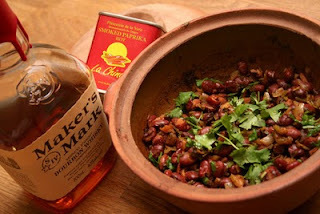 This recipe is all about the bourbon and the beans take on it's flavour to full effect. I have found Makers Mark an excellent accompaniment to this recipe. Alternatively, Wild Turkey (original or 101) and/or Jack Daniel's actually work just as well, as I am sure all bourbons will. Just think about the flavour you find in a bourbon and try to match that. For example, Wild Turkey is rich and sweet so fresh corn is a great additive, while JD has a very obvious charred maple taste which lends itself nicely to barbecuing with smoking hickory chips while roasting some pork ribs. Secondly, the other essential ingredient is smoked paprika. Mild, medium or hot...it does not matter as it really is to your taste, but smoked it has to be. For the last 15 years I have always kept at least one can of 'La Chinta' smoked paprika (see item in image) in the cupboard. You can pick this up at any good deli. If there is ever an ingredient you need it is this stuff. The flavour is fantastic and somewhat surreal in what it does to food. If you love to cook on the BBQ, bake some ribs, or grill a t-bone you cannot go past this. You will also find the smallest teaspoon is enough and a can will last you a good year and on. Prep is very small for this recipe as it literally all goes in together and baked in a medium oven. I like to use clay earthen ware for baking as it keeps heat extremely even and less likely to burn if you have one to many glasses of wine and forget to check on the progress. Stainless steel pot is fine as well but you have to be more vigilant in monitoring the baking process. Otherwise cast iron with a ceramic coating is equally good as clay. small stainless steel pot with lid or clay pot with lid (small is extremely essential and also oven proof). It is essential this pot is small otherwise the ingredients will be too spread aprt and dry out way too quickly. A pot with a base no wider than 12cm to 14cm wide for this recipe. Anything larger will require you to double the mix. Step (1): Pre-cook chopped onions until semi translucent in olive oil. Don't burn or overcook as you need the onions to caramelise in the pot. Step (2): Add all ingredients except water and extra coriander into oven friendly pot. Remember do not over season as you can add more at the end of the cooking stage. The bourbon should make the mix wet but not swimming. If the mix is too dry then add just a little water and or more bourbon. You want the liquid to reduce in the oven and be absorbed by the beans. I tend to keep the water to the side just in case half way through things get too dry. Adding bourbon halfway through or at the end is not good as you will just be tasting the whisky (why water may be essential). Step (3): If you have time put the pot in fridge and let sit for 2 to 3 hrs. Take from fridge at 2 1/2hr mark and allow to return to room temp before placing in oven. Step (4): Place pot in oven and let bake for 45min to 60min. Check on mix 3 or 4 times through the process to ensure it is not drying out, burning or catching on base. When ready the mix should have a slight pastiness to it but be dry. Feel free to adjust the oven in temp as required but do not exceed 210c degrees or ingredients will boil and burn. Step (5): Remove from oven. Gently mix through extra coriander and serve in pot. Proof in in the pudding when it comes to this recipe and I have tested on many individuals, particularly those that don't like bourbon. I have had many-a-comment on how nice it tastes. Also guaranteed to increase virility of any ladies man. Go for it, tuck in and let me know how it goes. If I was to give a dram I would say this is a dramming sensation! With the next D.T.W.C. coming up in a matter of weeks, I am more than happy to offer to prep this dish and bring it over, assuming the host is obliging to offer his oven!